Download & Installs Software. 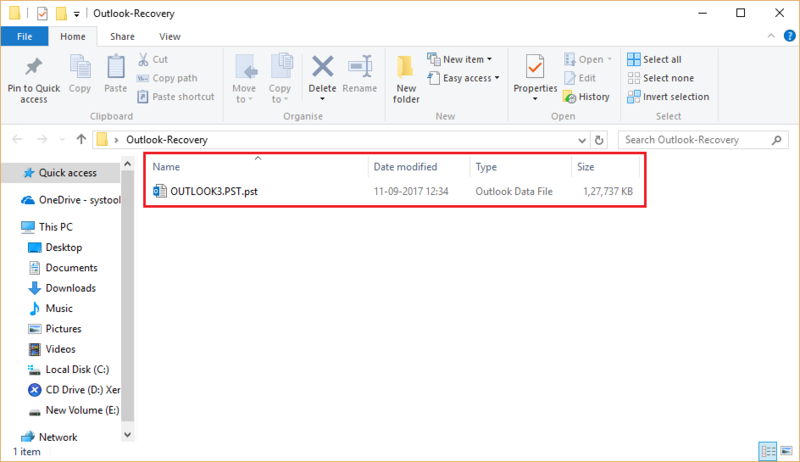 Launch the tool from Start » All Program » Outlook PST File Recovery Tool. 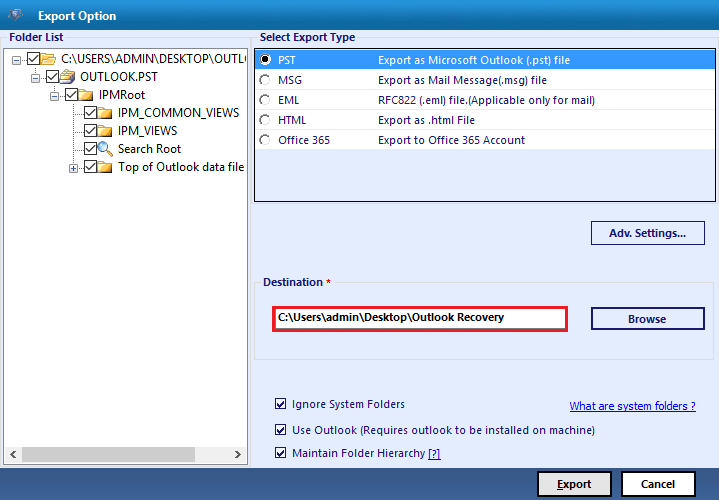 Click on Add file option in the navigation to add Outlook Data file PST. 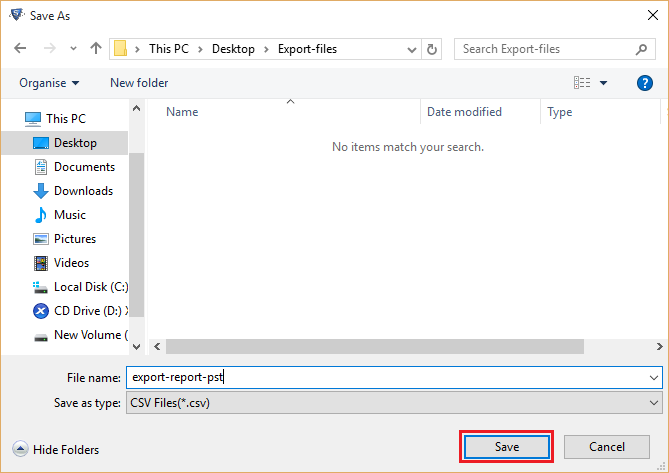 As soon as you click on the Add Files button, "Add File" Window pops up to let you select one of the given options like, Select File, Search File. 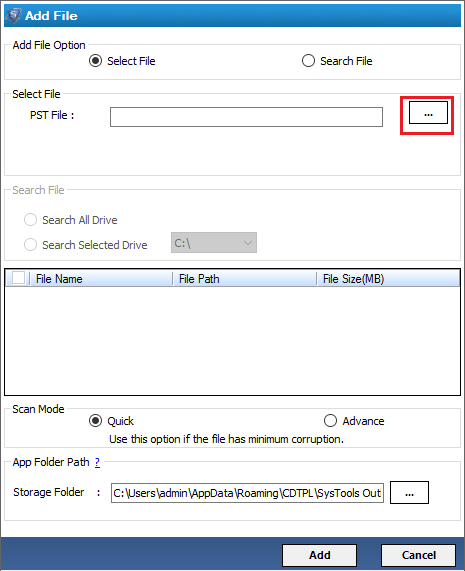 Click on the "Select File" button to browse the PST file and then click on the dotted button. 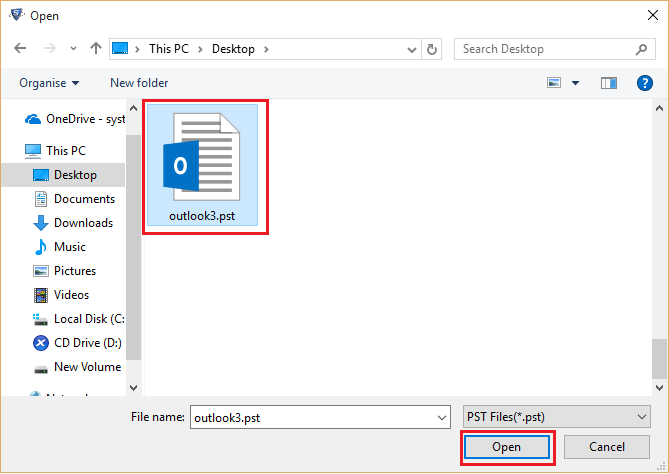 Browse the Outlook PST file, select it and click on "Open" button. 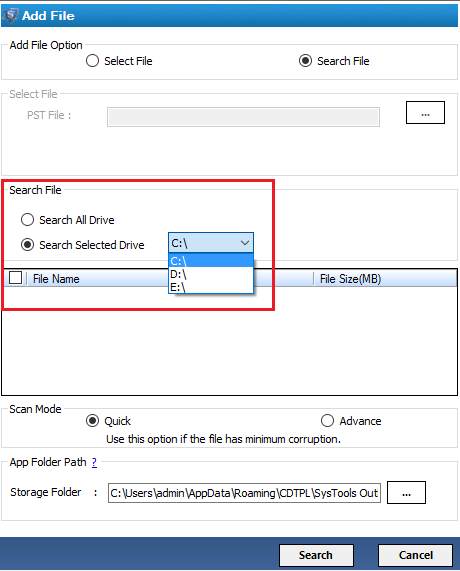 When you click on Select Search Option then two options are available for searching the .PST files. 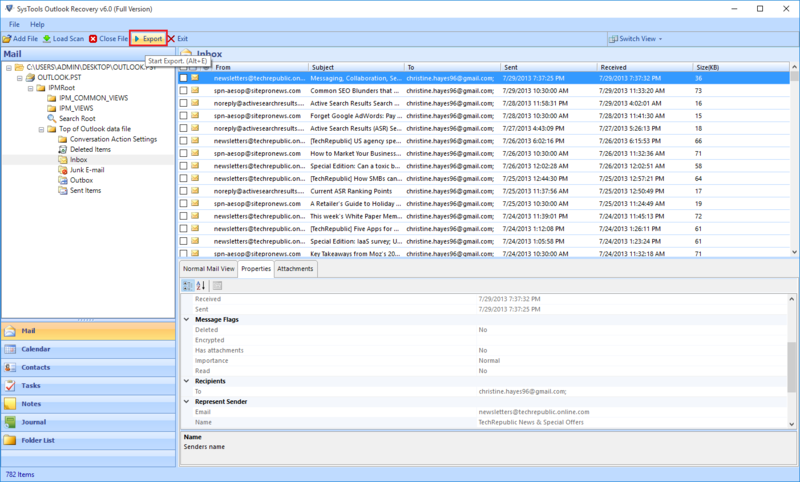 After the searching process is completed, the software displays the list of PST files stored on entire drive as shown. The software provides two modes for scanning: Quick and Advance. 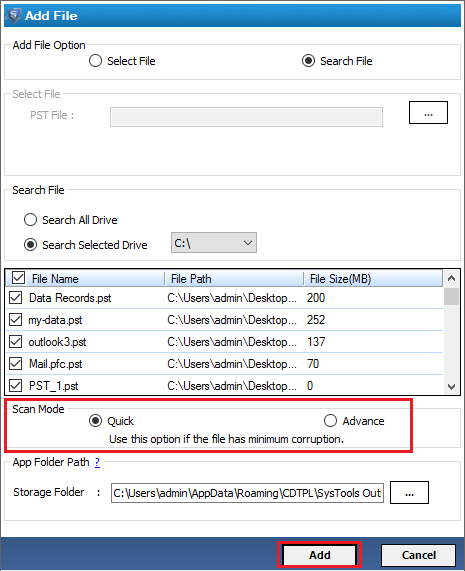 Quick scanning mode: Provides faster recovery of PST files. 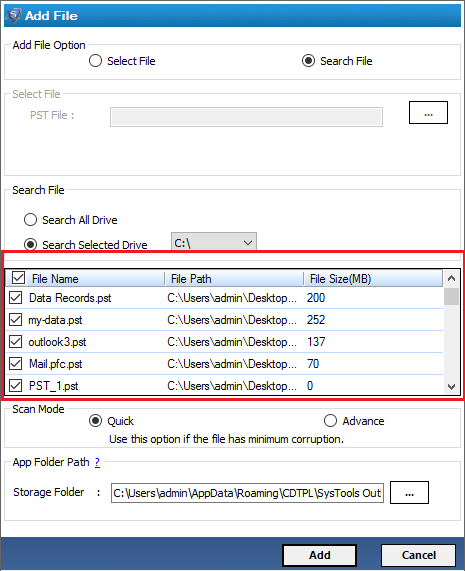 Advance mode: If you are not able to view the data after using quick scan mode or if the PST file is highly corrupted then use the Advance scan mode. As it is designed for deep data recovery task. This Software support Advance Scan on 64 bit OS also. The software will start the scanning process of PST file. 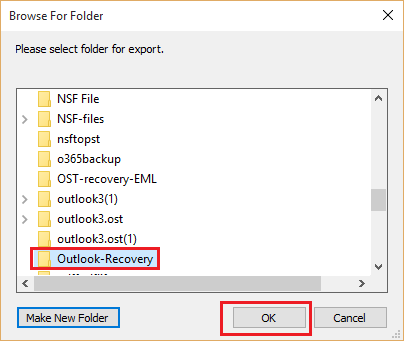 As soon as the scanning process is completed a dialog box appears confirming success of the scanning process, the left most panel displays the list of folders in the complete folder/directory hierarchy. 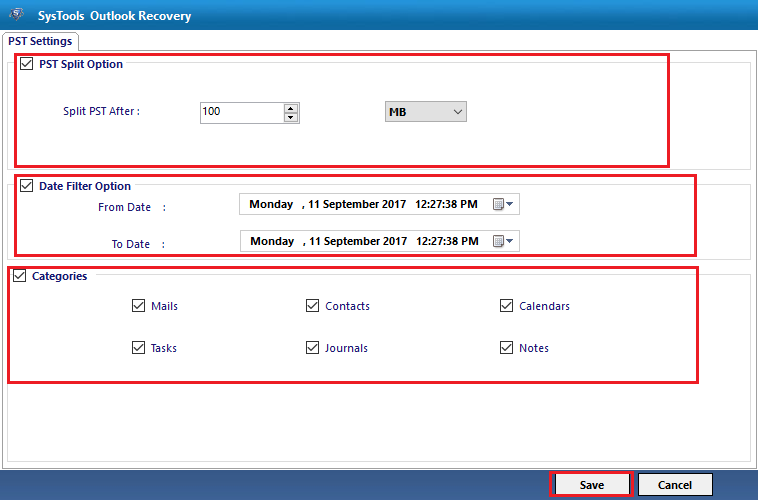 Now user can save scan report if he needs. 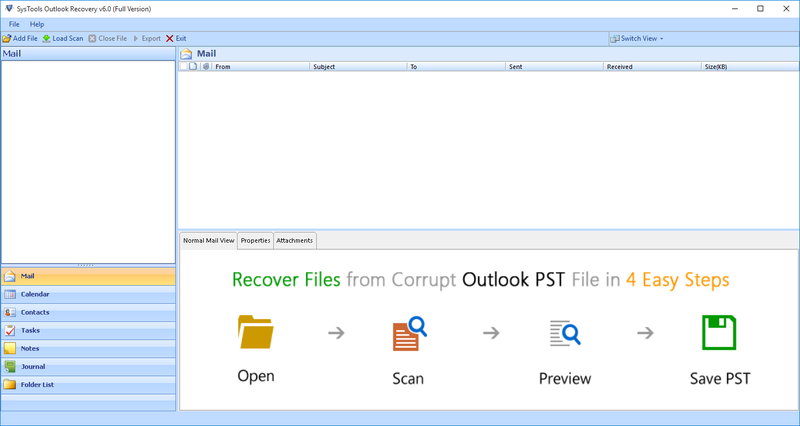 Click on Yes button if you want to save the scan results for the PST file. 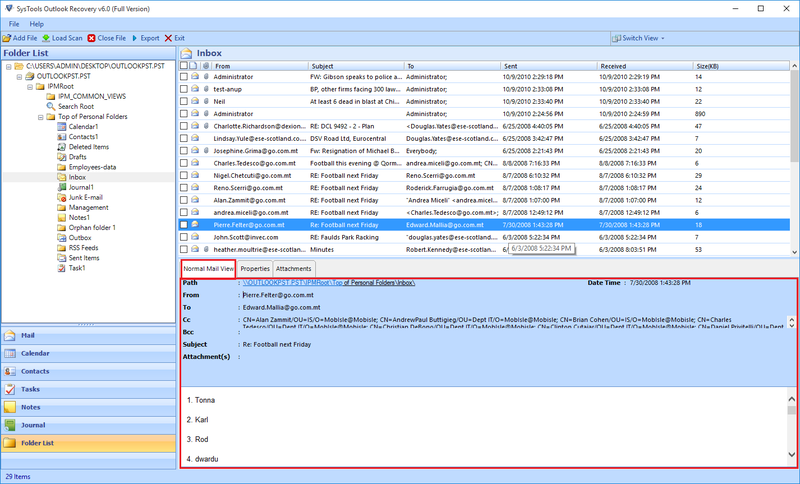 Normal Mail View: Select a particular Email to get a Normal Mail View of the e-mail data at the bottom pane. Attachments: Preview Attachments present inside a particular email by clicking on the Attachments tab . 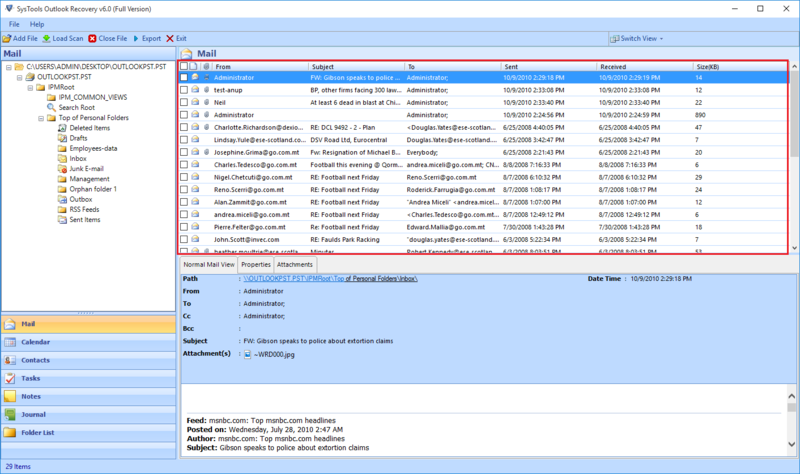 It displays the list of attachments along with details present in the same & upon selection, the attachment is previewed on the bottom right corner. Now you can view all the folders and mailbox items. There are tabs: Mail, Calendar, Contacts, Notes, Journal and folder list in the left side of the window to show specific mailbox items. 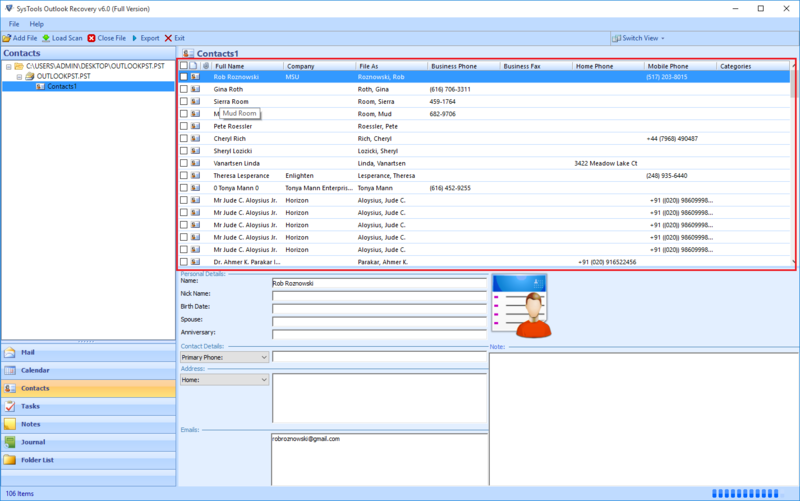 Click on Contacts tab to view the address book information in the software. 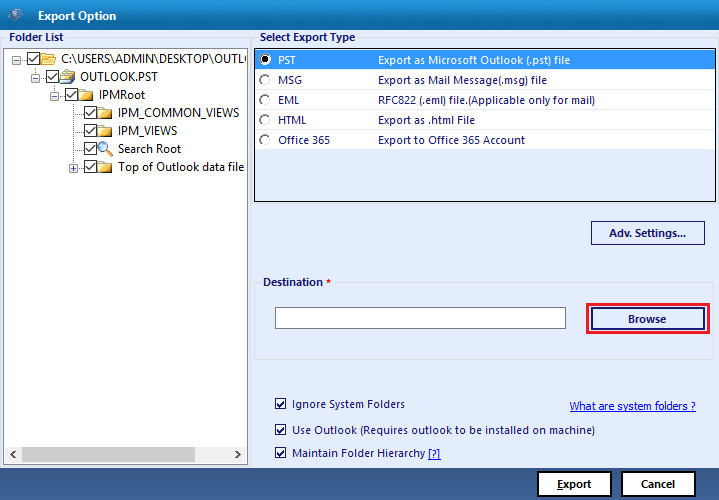 Select the Export Button to migrate mailboxes. Split PST : To Split all the PST files using the size that can limit the size of the PST files. 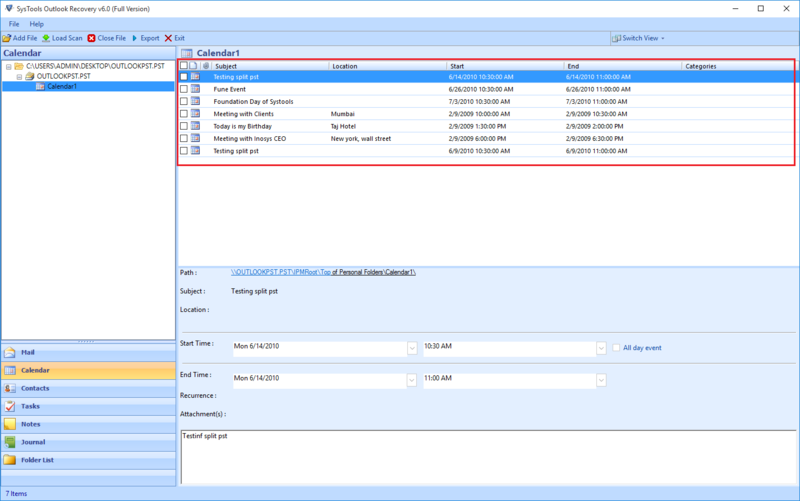 Date filter option: This allows the user to migrate specific data from the PST files. 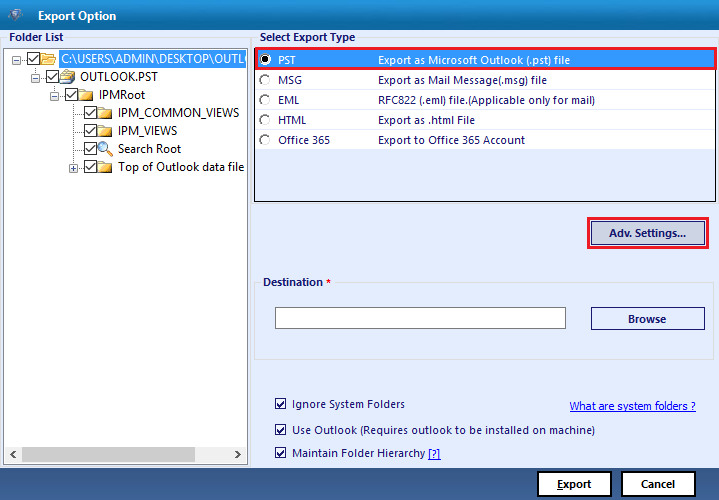 categories: As per which we can export the specific components of the PFC file such as mails, contacts, calendars. The settings will be saved successfully. On the previous menu Click on the "browse" button. 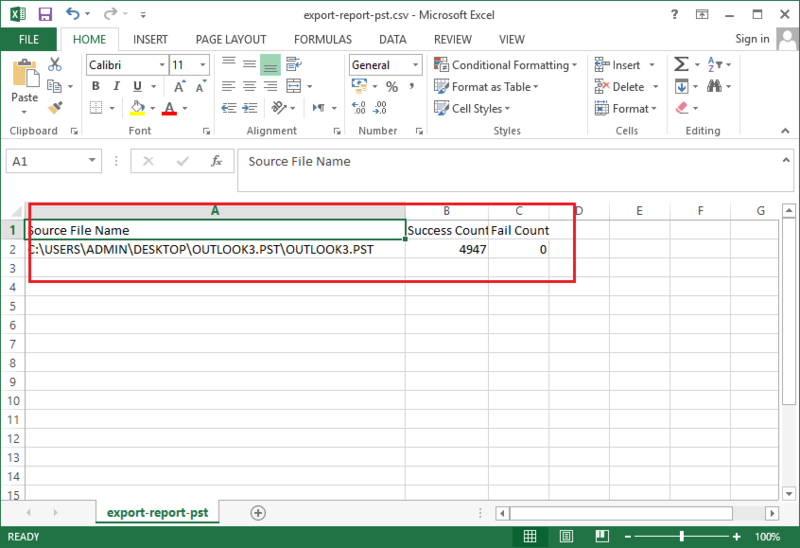 Click on the "Save" Button to save the report in the CSV file format. 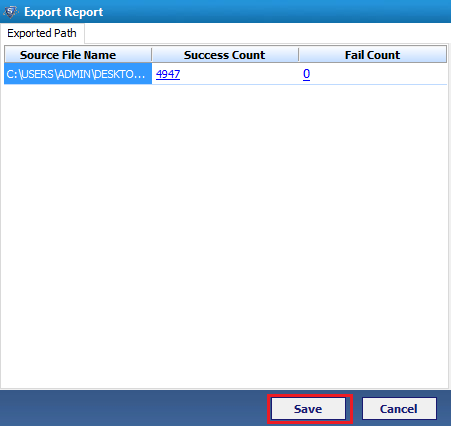 Now, Specify the location where the CSV file can be saved. Browse the location to save the CSV report. You can view the report of the whole process. You can view the final PST files in the specific final location.